Whoa nellie!! Was it chilly out on Thoroughbred tonight!! I’m getting out my woolen underwear and wool socks for tomorrow night. Yes. We have given away Lots of hot chocolate . . . lots of cookies . . . lots of tracts . . . and have met lots of people. We are up and running for the second weekend. Along the way there was time also for a few evangelistic conversations. 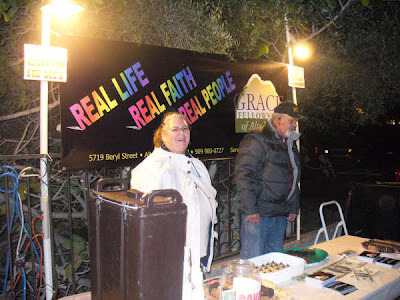 Pray for God to open hearts of those we spoke with and those who received our tracts. Come and join us at the corner of Thoroughbred and Sapphire.